www.machinerylubrication.com | March - April 2014 29 BOOK STORE how to Use a grease gun training Video Format: DVD Publisher: Noria Corporation The grease gun is one of the most widely used tools for machinery lubrication, yet few are trained on grease gun best practices. When used or loaded improperly, the grease gun can become a safety risk to both the lubrication technician and the machine. Maintenance, replacement, and reliability: theory and applications — second edition Authors: Andrew Jardine, Albert Tsang Based on the results of real- world research, this book focuses on data-driven tools for asset management decisions. It provides a solid foundation for various tools that can be used to optimize key maintenance/replacement/reli- ability decisions while presenting cases that illustrate the applica- tion of these tools in a variety of settings, such as food processing, petrochemical, steel and pharmaceutical industries. how to select a Motor Oil and Filter for your Car or truck Author: Jim Fitch Publisher: Noria Corporation Before spending any more money on oil changes, synthetic oils, premium ﬁlters, engine ﬂushes or oil treatments, learn what leading lubrication expert Jim Fitch recommends. With these sound recommendations, you'll know exactly what to do next time you change your oil — for about the price of an oil change. Machinery Failure analysis and troubleshooting — Fourth edition Authors: Heinz P. Bloch and Fred K. Geitner This classic, comprehensive guide to analysis and trouble- shooting may help you solve the machinery failure problems costing you time and money. Covering both the engineering detail and management theory, Machinery Failure Analysis and Troubleshooting provides a robust go-to reference and training resource for all engineers and managers working in manufacturing and process plants. Overgreasing doesn't Pay Poster Publisher: Noria Corporation This poster helps overcome the common misconception that a bearing is full when grease starts to come out of the seals. Hang this poster to send a clear message that proper lubrication is important to your organization. Tips include how excessive grease can cause high temperatures, which results in oxidation of the lubricant, and why you should always clean the dispensing nozzle of the grease gun before use. lubrication and Maintenance of industrial Machinery Author: STLE This book can be used by everyone in the production process, from supervisors to ﬂoor personnel. It explains the key role of effective equipment lubrication practices in a proactive reliability-based main- tenance program. Learn the best practices for achieving the cost reduction and the inherent resultant increase in operational reliability. Welcome to Machinery Lubrication's Bookstore, designed to spotlight lubri- cation-related books. 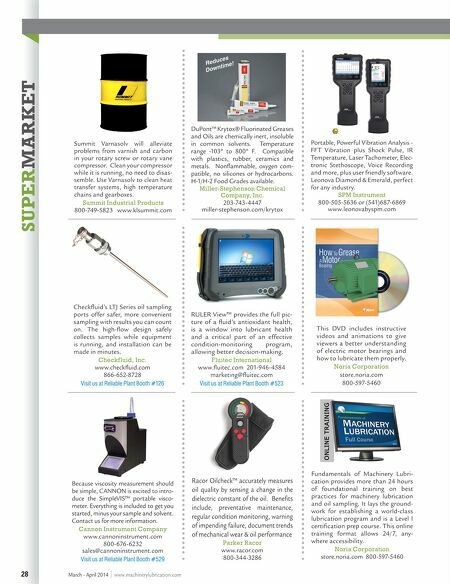 For a complete listing of books of interest to lubrication professionals, check out the Bookstore at store.noria.com. 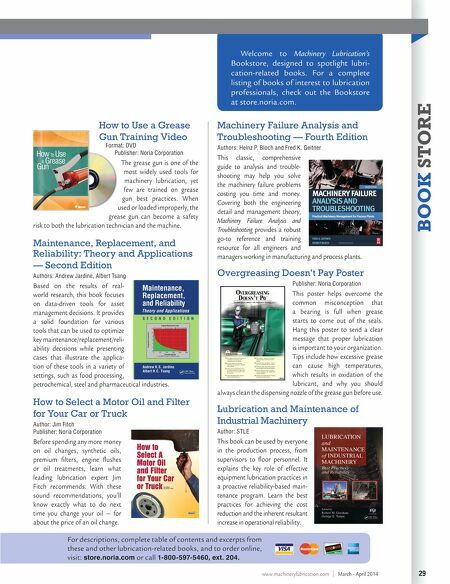 For descriptions, complete table of contents and excerpts from these and other lubrication-related books, and to order online, visit: store.noria.com or call 1-800-597-5460, ext. 204.